The Fokker F27 at one time was the mainstay of the channel express fleet , But when more modern and more capable aircraft became available it was down graded to basic training aircraft , However it is still more than capable of carrying out passenger & lighter cargo flights if required. Mk 200/500/600 - Two 1730kW (2320ehp) RollsRoyce Dart Mk 5367R turboprops driving four blade Dowty Rotol propellers. FH-227E - Two 1715kW (2300shp) Dart 5327Ls. Mk 500 - Normal cruising speed 480km/h (260kt). Service ceiling 29,500ft. Range with 52 passengers and reserves 1315km (710nm). FH-227 - Max cruising speed 473km/h (255kt), economical cruising speed 435km/h (236kt). Range with max payload 1055km (570nm), range with max fuel 2660km (1440nm). Mk 500 - Empty 12,243kg (26,992lb), operating empty 12,684kg (27,964lb), max takeoff 20,410kg (44,996lb). FH-227 - Operating empty 10,398kg (22,923lb), max takeoff 20,639kg (45,500lb). Mk 500 - Wing span 29.00m (95ft 2in), length 23.06m (82ft 3in), height 8.71m (28ft 7in). Wing area 70.0m2 (753.5sq ft). FH-227 - Same except length 25.50m (83ft 8in), height 8.41m (27ft 7in). Flightcrew of two. 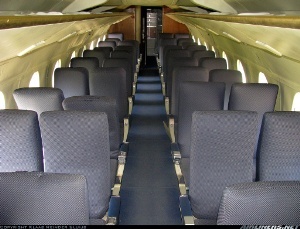 Seating for 44 at four abreast and 76cm (30in) pitch in original fuselage length versions (Mks 100, 200, 300, 400, 600 & F-27). Standard seating for 52 and max seating for 60 at 72cm (28.5in) pitch in Mk 500. 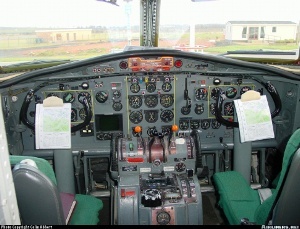 FH-227 seats 52 at 79cm (31in) pitch, or a maximum of 56. 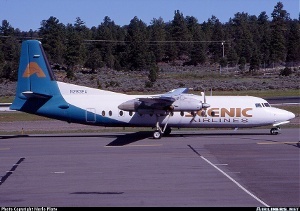 Probably the closest to being the fabled DC-3 replacement, the Fokker F-27 Friendship, including the Fairchild built F-27 and FH-227, was built in greater numbers than any other western turboprop airliner. The Fokker F-27 began life as a 1950 design study known as the P275, a 32 seater powered by two RollsRoyce Dart turboprops. With the aid of Dutch government funding the P275 evolved into the F-27, which first flew on November 24 1955. This original prototype was powered by Dart 507s and would have seated 28, by the time the second prototype had flown (in January 1957) the fuselage length grew to allow seating for 32. By this stage Fokker had signed an agreement that would see Fairchild build Friendships in the USA. The first aircraft to enter service was in fact a Fairchild built F-27, in September 1958. Fairchild F-27s differed from the initial Fokker F-27 Mk 100s in having basic seating for 40, a lengthened nose capable of housing a weather radar, and additional fuel capacity. Developments included the Mk 200/F-27A with more powerful engines, Mk 300/F-27B and primarily military Mk 400 Combi versions, the Mk 500 with a 1.50m (4ft 11in) fuselage stretch taking seating to 52, and Mk 600 quick change freight/pax aircraft. Fairchild independently developed the stretched FH-227, which appeared almost two years earlier than the Mk 500. The FH-227 featured a 1.83m (6ft 0in) stretch over standard length F-27/F-27s, taking standard seating to 52.